In this series of posts about an uncooperative African penguin, she retells one particular experience while conducting field research of wild penguins. Catch up by reading previous posts: Part 1, Part 2, Part 3 and Part 4! The fog hovers over the coast for most of the morning. As soon as it begins to clear, the wind returns with its usual vengeance. At 5:00 pm we repack the vehicle for the umpteenth time and head for Guano Bay. The wind seems to be dropping. Again we take turns staring through the telescope, scanning the colony and landing beach from the shore. As the sun is setting, Katta calmly announces “there she is, she just arrived.” We are on Halifax Island in record time. I am not taking any chances and have brought my catch-net along. 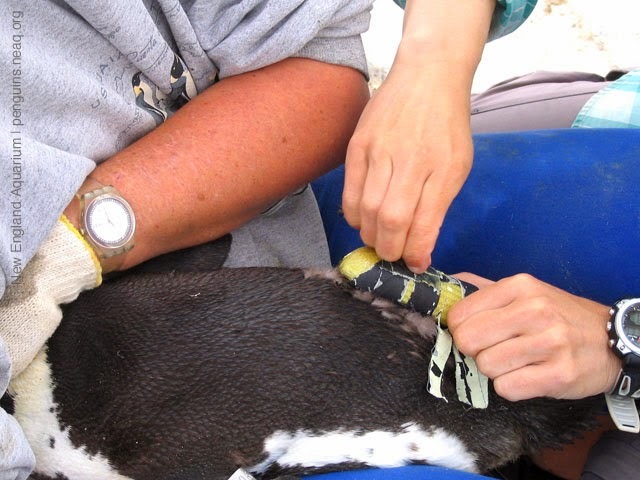 Detaching the logger: Katta carefully unwraps the lattice of tape holding the logger while I hold the penguin. Normally I catch penguins directly by hand because it is a calmer approach, but with a nervous penguin it can be less stressful with a net. We carefully move toward colony 2. She is lying next to one of her chicks, looking in our direction. All we can see are loose tape ends fluttering on her back. Our hearts stop. Has the logger fallen off? Is she just wearing the lattice of tape strips? We slowly shift position to see her back, but still can’t confirm whether the logger is attached or not. I slowly tip-toe closer, focused, catch-net at the ready. I am about 2 m away from her when she becomes aware of me. She gets up and edges away. Before she has a chance to run, I put the catch-net over her. Got her. And yes, the logger is still attached. Just. Her chicks must have had fun undoing and playing with the tape ends, but our precious logger is there. We quickly take off the logger and tape. I carry her back to her nest and fully expect her to make another dash through the colony. Not so. She calmly settles next to her chicks. All is well. On our way back we are overcome by a giggling fit; it must be the relief kicking in. It is now getting dark. And for the first time in ages we both catch the perfect wave to the shore. Stay tuned for the last post of this series. It'll bring home why the researchers go to such lengths to attach—and retrieve—these GPS data loggers. Can't wait? Want to see penguins in person? Visit the Aquarium! It's the summer of Penguinology right now. So not only will you be able to observe more than 80 penguins, you'll be able to learn the most wild and surprising facts about these beloved birds.